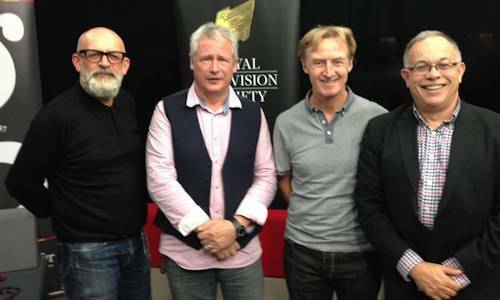 The RTS Wales Centre has also presented a number of other lectures, with eminent speakers from across the television and media industries. For more information about the television industry in Wales, see the RTS Wales Centre's Useful Resources, containing lists of links, videos, books, and significant dates. 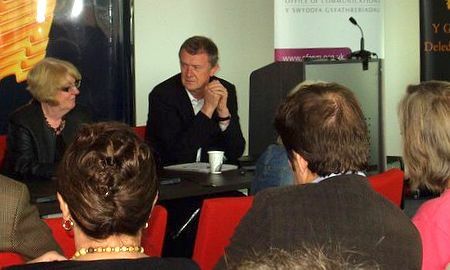 "I'm in listening mode", declared Professor Stewart Purvis, Ofcom's Partner for Content and Standards (above with Prof. Elan Closs Stephens), having outlined the regulator's thinking on the emerging landscape of Public Service Broadcasting in Wales to a large and very interested audience in the new ATRiuM building of the University of Glamorgan. Trevor Phillips OBE. Diversity In The Media. 30th October 2008. 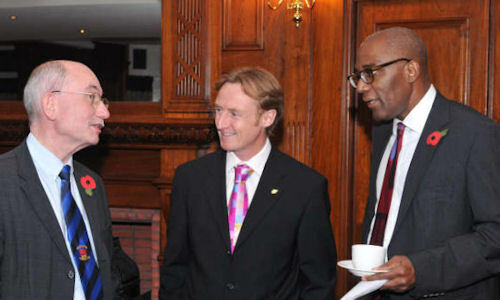 Trevor Phillips OBE, Chair of the Equality and Human Rights Commission, paid a flying visit to Cardiff to address RTS Wales Centre members and their guests on the often vexed question of "Diversity in the Media". Phillips delivered a dynamic lecture which inspired his large audience to ask several pertinent questions in the Q&A afterwards. Graeme Park chaired a large panel. "Is There a Future for Broadcasting in Wales?". 22nd October 2015. The RTS Wales Centre joined the Institute of Welsh Affairs in a 'coffee shop' debate on the future of Welsh broadcasting in the TV studio at Glyndŵr University in Wrexham. In a pre-recorded video message, Ken Skates from the Welsh Government expressed concern about the weakening position of broadcast media in Wales. Hywel Wiliam then gave a brief overview of the key features of the current communications market. Click here to watch a video of the discussion, now available in Glyndŵr University's YouTube site.